Ranbaxy Laboratories today said it has acquired Terapia, the largest independent generic company in Romania, for $324 million and aims to make that country its manufacturing hub in Europe. 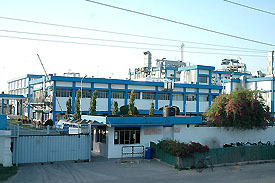 Ranbaxy’s Mohali unit is seen in this photograph clicked on Wednesday. Pharma major Ranbaxy Laboratories acquired Terapia, the largest independent generic company in Romania, for $324 million. Infrastructure growth bounced back to 5.6 per cent during February 2006 from a meagre 0.8 per cent in the same month last year, largely on the back of a surge in power generation and coal and cement production. 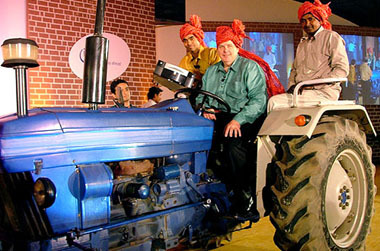 President Intel India Frank Jones (centre) drives a tractor at the launch of Intel Community PC in New Delhi on Wednesday. World’s largest chipmaker Intel launched a personal computer platform conceived and designed to suit the rural Indian environment. The PC, which would be priced between Rs 20,000 and Rs 30,000, can work in temperatures of up to 50 degree Celsius. Prime Minister Manmohan Singh is planning to convene a meeting of Chief Ministers for evolving a political consensus on reforms in the power sector. A meeting of Empowered Committee on Industries, headed by the Punjab Chief Minister, Capt Amarinder Singh, today approved 19 mega projects to be set up in Punjab with an investment of about Rs 4,373 crore. US energy major Chevron may pick stake in Reliance Industries' Rs 27,000-crore refinery at Jamnagar in Gujarat and become the first to infuse FDI in India's booming refining sector. GAIL India Ltd. today signed a term sheet with Panna-Mukta Tapti JV (PMT JV) for gas supplies from the PMT fields commencing from April 1. Pursuant to recent negotiations, GAIL will be receiving about 5 MMSCMD of gas from the PMT JV at purchase price of $ 4.75/MMBTU, from April1, 2006, for a period of two years till March 31, 2008. India’s English language news channel NDTV and Genpact Ltd, formerly GE Capital International Services today announced a tie-up to offer media outsourcing services to global enterprises. India today raised the issue of alleged discrimination of its nationals in their bids for corporate takeovers in Europe, while as Luxembourg maintained that its opposition to Mittal Steel’s bid for rival Arcelor had nothing do with nationality, but only shareholders. HDFC Bank today hiked its interest rates on Foreign Currency Non- Resident deposits by 25 basis points. This came close on the heels of the RBI’s decision to hike the FCNR deposit interest rate ceiling by 25 basis points yesterday. US-based Tacpro Inc and Avalon Medical Services Pte Ltd, Singapore. The deal, which saw Ranbaxy acquiring 96.7 per cent stake in Terapia, will give the Gurgaon-based company two manufacturing units, bioequivalence centres, 60 products and access to Terapia’s coverage of nearly 4,000 pharmacies and 450 hospitals in Romania. “The deal will combine the strengths of the two premier generic companies and will allow Ranbaxy to leverage its expanded base in the rapidly growing Romanian pharmaceutical market, across the European Union and the CIS markets,” CEO and Managing Director, Ranbaxy Laboratories Limited Malvinder Mohan Singh said. The deal completion is expected within the second quarter of fiscal 2006-07. “Terapia represents exceptional value for our stakeholders. Within the Ranbaxy fold, it unleashes multiple synergies of product development, product flow, low cost manufacturing, proximity and access to high growth markets while being earnings accretive to the group immediately,” Mr Malvinder Singh said. “For Ranbaxy, Terapia delivers strategic Romanian and pan European synergies helping to unleash new opportunities,” he added. He said Ranbaxy would be moving its European manufacturing to the two facilities of Terapia, which has the capacity to make oral and liquid formulations and sterile injections. “In future, we intend to make Terapia’s faculties our hub for manufacturing in Europe,” Mr Malvinder Singh said, adding though the facilities are not yet USFDA approved, it will be filing an application in the near future. He said the acquisition would help the company unleash new opportunities in Romania and pan European synergies and it would provide Terapia with additional products to launch in the domestic market at very cost competitive levels, thereby lowering costs and delivering value to both consumers and the domestic healthcare budget. “This acquisition is an absolutely a good buy for us as it will give us access to one of the fastest growing markets in Eastern Europe, CIS countries. The market there has been growing at about 15-20 per cent annually, and Terapia will drive our future growth,” Mr Malvinder Singh said. Terapia has 30 per cent of its product portfolio registered in over 15 countries including the high growth generic markets of Russia, Ukraine and Poland. “Even, the cost competitiveness of Romania gives us the advantages of manufacturing in Terapia’s facilities,” he said. Asked if this would be the last of Ranbaxy’s acquisitions in Europe, Mr Malvinder Singh replied in the negative. “We are looking at more mergers and acquisition activities. There’s a lot more to be done in Europe,” he said, adding, the company is keeping its options open in the emerging markets as well. “We still have some more money in the bank and that will be utilised for future acquisitions,” he said, adding the acquisition of Terapia will be completed in second quarter. Commenting on the deal, Terapia Chief Executive Stephen Stead said: “We welcome this move as combining the two companies commercial operations will establish a market leading position in the domestic primary care market and a superb platform for the introduction of new products.” Further investment into Terapia’ s Research and Development capabilities and manufacturing facilities, will create a major regional hub for the Ranbaxy business,” Mr Stead added. Ranbaxy had announced the purchase of GlaxoSmithKline Plc’s Italian generic business on Monday, and of the rights and assets of Senetek Plc’s autoinjector device last week. The core sector growth could have been even higher, but for the decline in steel and crude oil production. The other four sectors — oil refining, coal, cement and power — showed improved production levels during the month. However, cumulative growth during April-February 2005-06 was at 4.5 per cent as against 5.8 per cent in the corresponding period last fiscal, according to latest data released by the government today. During February, while cement production rose 16.3 per cent compared to 1.3 per cent in the same month a year ago, electricity generation increased by 9 per cent as against a negative 0.8 per cent in February 2005. Coal production rose by a strong 9.3 per cent from 2.2 per cent a year ago and refinery output grew by 6.2 per cent compared to a negative 3.5 per cent growth in February 2005. Crude oil production fell 2 per cent during the month under review as against a decline of 4.9 per cent in February 2005, while finished steel production nosedived to a negative 1.1 per cent as against a strong 6.0 per cent growth in the same month last year. The slowdown during April-February this fiscal was mainly on account of fall in crude oil production and refining output. Cumulative crude oil production during the first eleven months this fiscal at 29.357 MT declined 5.5 per cent against a growth of 1.9 per cent in the same period last fiscal. Coal output at 37.8 million tonnes was higher than 34.5 MT production in the year ago month. Total production during April-February 2005-06 at 362.9 MT grew 6.4 per cent from 7.6 per cent in the same period last year. Cement production grew by 16.3 per cent to 12.757 MT as against 10.971 MT in February 2005. Total production so far this fiscal rose 11.9 per cent to 133.158 MT. “I know that we need to do a lot in the power sector to provide electricity to all and at affordable rates. I am convening a conference of all state chief ministers to form a political consensus,” he said, launching work on the Rs 3,780-crore Barh Transmission system to be developed by PowerGrid Corporation Limited (PGCIL). Union Power Minister Sushil Kumar Shinde said the conference of chief ministers was expected to be held after the assembly elections in various states. This could be possible only in the first week of June, he said. Work on Barh Transmission System was launched in the presence of former Prime Minister Chandra Sekhar, who represents Ballia Lok Sabha constituency, and UPA chairperson Sonia Gandhi. The project, being implemented by the PowerGrid Corp of India Ltd (PGCIL), envisages the transfer of power from the National Thermal Power Corp’s 1,500 MW Kahalgaon-II and 1,980 MW Barh projects in Bihar to Ballia and then wheeling it to different northern states. “Ballia is planned to be the power hub for receiving power from major generations in eastern region like Kahalgaon-II and Barh for its onward transfer to load centres in northern region,” said R.P. Singh, chairman and managing director of PGCIL. To be completed in 2008-09, the project would help to improve the quality and reliability of power supply to all states of northern region, including Uttar Pradesh. Apart from being part of the transmission highway, the new project would also facilitate transfer of surplus power from the NE regions to major load centres like Bhiwadi in Rajasthan, Lucknow and Mau in Uttar Pradesh, Moga in Punjab and Hisar in Haryana. A spokesperson of the government claimed that this would generate employment for nearly 21,000 persons, besides large-scale indirect employment. Those cleared are two manufacturing projects of Steel Strips Wheels and Indian Acrylics, to be set up in Patiala and Sangrur districts, respectively. These shall have an investment of Rs 249 crore. The committee also approved six multiplexes in Jalandhar, Ludhiana, Amritsar and Pathankot and five hotel projects in Mohali, Amritsar, Patiala and Ludhiana entailing an investment of Rs 676 crore. An IT project by Trident Infotech Corporation and a project for industrial park in Ropar district with an investment of Rs 85.56 crore and Rs 952 crore, respectively, were also approved. The Committee also approved two projects related to agro-processing of Crown Milk Specialties at Mohali and PR India at Gurdaspur, at a cost of Rs 35 crore and Rs 42.21 crore, respectively. Two projects pertaining to development of townships, housing and urban development and infrastructure have been cleared. These are SBL City Mega Housing Project at Ludhiana, spread over an area of 110 acres at a cost of Rs 100 crore. A 700-acre special economic zone (SEZ) has also been approved along the Zirakpur-Dera Bassi highway. This shall have IT companies, a residential township with plots and multi-storeyed flats and other infrastructure like school and college. This will bring in an investment of Rs 2,243 crore. Reliance Industries Ltd (RIL) Chairman and Managing Director Mukesh Ambani is in the USA meeting top executives of Chevron for a possible pact, industry sources said. RIL officials were not immediately available for comment. The 29 million tonnes per annum refinery, located in Jamnagar Special Economic Zone, is being set up for exports and the company was eyeing the multi-billion dollar high octane gasoline market in the USA. Chevron, besides bringing steady source of crude supply for the refinery, may also pick a substantial volume of petroleum products produced at the new unit, the sources said, adding the company is planning to tap export markets in the USA and Europe for its products. Reliance Petroleum, the wholly- owned subsidiary of RIL, plans to convert the bulk of gasoline from its proposed SEZ refinery into high octane gasoline and export it to the USA. Petrol and diesel will make up for 80 per cent of the products produced by Reliance Petroleum. Typically, 70 per cent of the output will constitute auto fuels. Also on Reliance's radar is a possible technology pact with Chevron for sourcing some of the refining process and possibly know-how for developing its 'D6' deepsea gas field in Krishna Godavari Basin in the Bay of Bengal. The new refinery, located at a site adjacent to RIL's existing 33 million tonnes per annum refinery at Jamnagar, would produce 1,213 million tonnes of diesel and 8-10 million tonnes of petrol. GAIL India Ltd. today signed a term sheet with Panna-Mukta Tapti JV (PMT JV) for gas supplies from the PMT fields commencing from April 1. Pursuant to recent negotiations, GAIL will be receiving about 5 MMSCMD of gas from the PMT JV at purchase price of $ 4.75/MMBTU, from April1, 2006, for a period of two years till March 31, 2008. A company statement stated this price would be inclusive of the royalty and would be payable by the PMT JV to the Government of India. The term sheet was signed by Mr R. Suresh, Executive Director (Marketing), GAIL (India) Ltd., Mr Y.P. Ajmani, Vice-President (Petroleum), RIL; Mr Kapil Garg Managing Director, British Gas Exploration & Production India Ltd and Mr S. Vasudeva, Group General Manager JV (PSC), ONGC. As per the provisions of the term sheet, it said, the additional gas available after meeting the PMT JV contractual obligations, including that of GAIL, will be supplied to GAIL at $4.75/MMBTU on best endeavour basis. The term sheet provides for terms and conditions as generally found in gas sales contracts, including payment terms and quality. The joint venture aims to deliver value-based services to global media and entertainment customers. The venture will combine NDTV’s brand image, domain knowledge and world class media skill with Genpact’s offshore experience, global delivery capabilities, sales and marketing infrastructure, and reputation for operational excellence. “We hope to break new frontiers and push India’s media envelope even further,” said NDTV Chairman Dr Prannoy Roy after the tie up. NDTV and Genpact will form a joint venture that will focus on providing cost effective, high quality media services to global and regional media and entertainment companies in spheres like editing, digitisation and closed captioning. At present 70 per cent of all media work is done digitally and 70 per cent of this can be outsourced. Currently decades of analog is being converted to digital from major process-based operations to high-end functionality. Mumbai: Zee Telefilms today announced a major restructuring of the group, which includes hiving off its cable distribution arm Siti Cable and DTH business Dish TV. Raising the issue with his Luxembourg counterpart Jeannot Krecke at a meeting, Commerce Minister Kamal Nath said certain statements have emanated from some European nations against takeovers and mergers, which raised concern among the industry community here. “He has assured me that it is not the issue of India. Luxembourg is a shareholder (in Arcelor). Their (Luxembourg’s) reaction is as shareholders and should not be taken as reaction on nationality of the person making the bid,” Nath told reporters after the meeting. Asked why India was supporting Mittal’s takeover attempt, he said: “For us, it is not an issue of Mittal, but national treatment.” On his part, Krecke said the takeover bill that is to be introduced in Luxembourg Parliament in May should not be construed as an attempt to scuttle Mittal Steel’s $22.7 billion acquisition bid for Arcelor. Krecke also called on Finance Minister P Chidambaram. He said the bill on which Luxembourg’s parliament will vote in early April — is not aimed at blocking Mittal’s bid for Arcelor, but would secure the interests of shareholders. Krecke said he also discussed a double-taxation treaty, awaiting India’s approval for a decade that would allow millions of dollars to flow into its economy via Luxembourg — one of the world’s biggest investment hubs. HDFC Bank today hiked its interest rates on Foreign Currency Non- Resident (FCNR) deposits by 25 basis points. This came close on the heels of the RBI’s decision to hike the FCNR deposit interest rate ceiling by 25 basis points yesterday. Earlier in the day, the Bank of Baroda too effected an upward revision on the FCNR deposits by an equal percentage. Meanwhile, the Central Bank of India today effected an upward revision of the interest rates on domestic term deposits of various maturity periods by 25 to 50 basis points. The new rates are effective from April 1, 2006, the bank said in a statement. Packaging major Essel Propack Ltd, through its wholly-owned subsidiaries, has entered into a share- purchase agreement for acquiring 85 per cent stake in US-based Tacpro Inc and Avalon Medical Services Pte Ltd, Singapore. The agreement has been signed by the company's subsidiaries, Lamitube Technologies Ltd, Mauritius and Lamitube Technologies in Cyprus, subject to fulfillment of certain conditions, it informed the Bombay Stock Exchange. Avalon and Tacpro are in the business of manufacture and sale of medical devices. The acquisition is expected to be completed by April 14, it said.